Welcome to your new Navigator card. 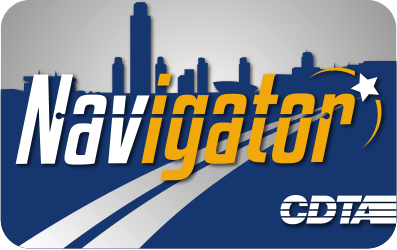 NAVIGATOR is CDTA's new smart card. NAVIGATOR is a long term, plastic card with a computer chip instead of a magnetic stripe like the Swiper. You can add Pay As You Go, Frequent Rider, or both products to your NAVIGATOR. NAVIGATOR cards can be replenished online, at retail outlets or over the phone. Frequent Rider is a discounted monthly pass that provides unlimited rides for 31 consecutive days from its first use. Up to 4 Frequent Riders can be stored on the card but only one can be purchased online at a time. All sales are final. Pay just $1.30 for each of the first 3 rides and ride the rest of the day for free on regular routes and BusPlus. Pay $3.50, $3.90 or $5.00 for NX Zones 1-3. Half Fare discount applies to half fare cards. Minimum online purchase amount is $10, maximum is $500. All sales are final.